We all know how graceful a singer Arijit Singh is, but little did we know of his humble nature. Wondering why? We’ll tell you. Arijit Singh and Salman Khan had a little fiasco where “bhai” felt insulted and hence declared that he wouldnt have arijit sing any of his songs in the movie. 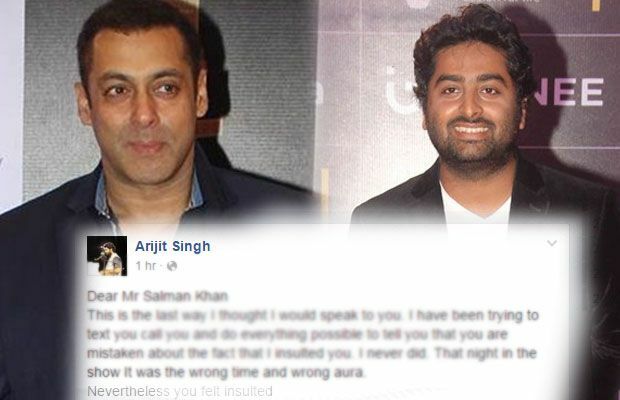 Since then, Arijit Singh has been trying different ways and trends to reach out to Salman so that he can apologize! He has been extremely humble and mentioned that he has absolutely no intentions of pulling any insults on Salman, just that it was all a matter of wrong timing. Arijit had very casually made a comment but somehow Salman took it to his heart and mocked him back. But, Arijit went out of his way to apologize to the superstar and he recently sent him a message out on facebook that created a lot of buzz. This is the last way I thought I would speak to you. I have been trying to text you call you and do everything possible to tell you that you are mistaken about the fact that I insulted you. I never did. That night in the show It was the wrong time and wrong aura. And I understood and I felt extremely sorry about it as me and my family have been your fan since long. I tried to explain so many times but you never got it. I apologized but you never got it. How many times I sent you apology texts you also know. At Nita Ji’s place I only came back to apologize to you but you didn’t get it. Please do not remove the song that I sang for you in sultan. You want anyone else to sing this song, absolutely fine but keep a version at least. I have sung enough songs sir. But I want to retire with at least one song of you keeping in my library. Please do not take away this feeling. I also know you won’t be bothered Mr Salman Khan. Still I think I need to take it out. After all I have to live with this fact that you made sure that I don’t sing for you even though so many of us requested. But I will be a fan bhaijaan..
Jagg ghumeya thare jaisa na koi..
Well, we all know our bhai and let’s just hope he will return back to his old self and forget this small drama.